-- Gregory Alan Isakov, 3 A.M. Dark clouds poured rain over the untarped load, the entirety of my material possessions, stacked-and-tied in the back of my buddy Kevin's red Toyota pickup the day I moved to Flagstaff. In my mind, the dark clouds that hung over my life that day were nearly as oppressive. In the figurative wake of my old friend's ersatz moving-truck, as of the fifteenth of August 1991, I wasn't just leaving Scottsdale behind, I was also leaving a still-bitter former fiancé and the smoldering remains of one truly bad relationship, a hardly-started career that I'd nevertheless washed clean out of, as well as every friend I'd made during the first 24 years of my life, including my best-friend, Kevin, who would within the hour turn his truck left onto Blackbird Roost, out of my run-down studio apartment's parking lot and, quite literally, out of my life. 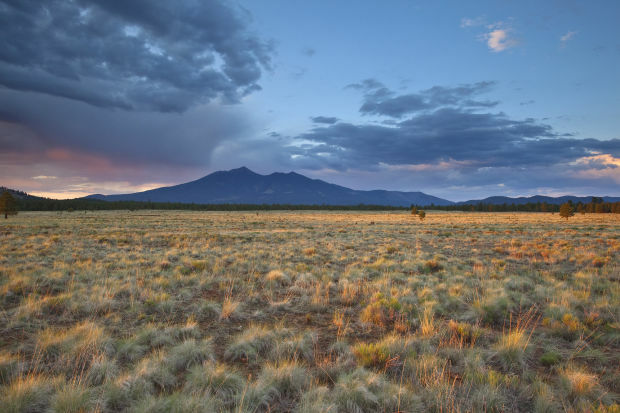 I settled into my new, mostly solitary, life in Flagstaff with greater ease than I had expected to. Each weekday morning, with a tattered blue pack on my back, the same one I'd used for years while in journalism school at ASU, I climbed through the rough, kicked-in hole in my apartment complex's wooden back fence, walked across the Greyhound station's dirty, potholed tarmac, and then down the short dark alleyway behind Andy Womack's Flamingo Motor Hotel to bolt across Route 66 near the Dairy Queen in order to get to my classes in the College of Ed Building at NAU. Each evening I walked back, often via the same route, but sometimes along Butler to Clay past the Furniture Barn after taking a detour from campus up to Southside, to get some slice at NiMarcos, a cup at Macys, or to drop in at Cosmic Cycles to smell the tires and Triflow and wander the floor lusting after new bikes. It is no small thing to say: the course of the remainder of my life was, quite literally changed forever, when, on one of my first visits to Cosmic Cycles, I spent a few of my then very-limited funds ($5.95+tax to be exact) on an early edition of a little day-glo green self-published book entitled Fat Tire Tales and Trails written by some dude who called himself Cosmic Ray. 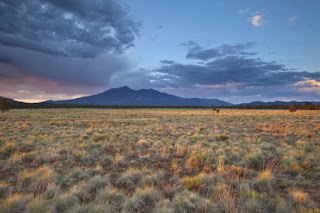 As a lovely parting-gift, on the eve of my departure from the Valley, my parents had purchased for me, at their local Price Club warehouse store, a new Motiv mountain bike to help me get around in Flagstaff. I'd been on several mountain bike rides in Phoenix on borrowed bikes in the years prior to moving to Flagstaff, but I'd never owned one of my own until now. Cosmic Ray's little green book changed all that. Having no TV (and this being the last silent decade before the cacophonous Internet replaced the bookish solitude of my life with cat videos), I spent that evening quietly poring over Ray's book, fascinated by every crudely-drawn map and the promises they each bore of new trails to ride and new places to discover which Ray related in a gregarious narrative voice that somehow felt familiar to me. "This is a guide to that elusive trail disappearing into the woods. That trail leads to the heart of the imagination... our childhood dreams of wander," he wrote in the introduction. As someone who had spent his childhood roaming around in the woods, I immediately understood Ray's intent. I did the ride backwards, in a clockwise direction, because the end of the loop, per Ray's directions, was just down the street from my apartment, right where the pavement ended and down the service road to the big tunnel under the tracks that I'd ridden to once or twice before. I figured I could piece together the rest of the ride, working the route out turn-by-turn by reading Ray's directions in reverse. I was mostly right about this. It rained a lot on that ride, hailed some too, none of which I was adequately prepared for, but through which I persevered undaunted and undeterred though too-near hypothermia in the end to consider the ride a victory. But it sure was awesome! The next day I spent a few more of my meager funds on a cheap green plastic rain-shell, purchased from a friendly guy named Mark at the Inner Basin Ski Shop which used to occupy the long, narrow storefront right next door to Cosmic Cycles. Carried it with me thereafter, always at the ready, for years. 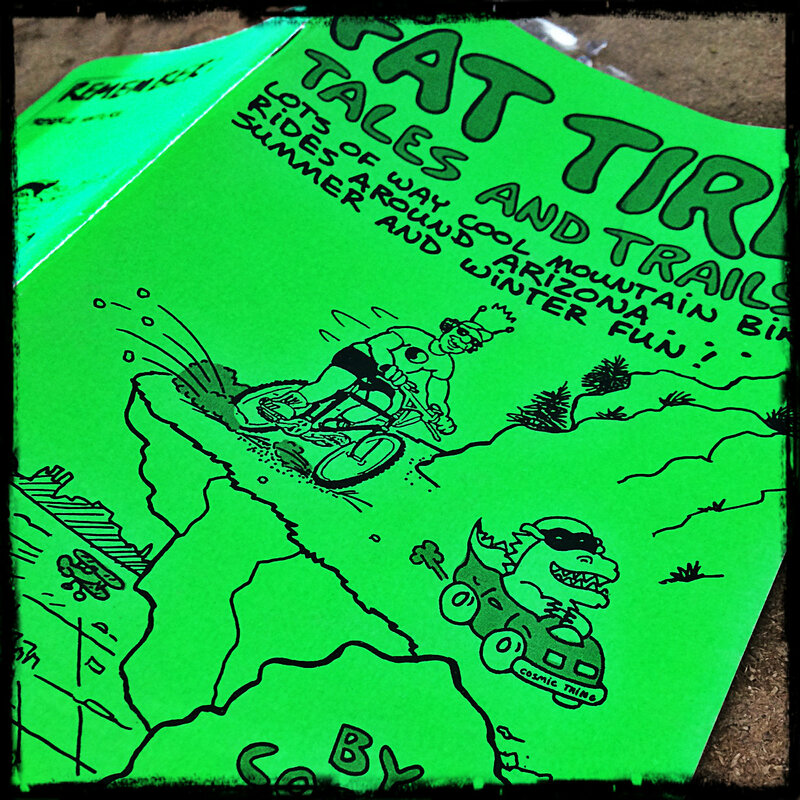 Over the years, I bought each new revision of Ray's book whenever it came out and used all of them faithfully to find cool new trails and interesting places to go on my bike. Better still, I got to know Ray. At first because, as the sole distribution rep for his books, he often came into the bike shop where I worked in the summertime to check on our inventory and sell us more books. The first time I met him, I told him how much his books had meant to me. 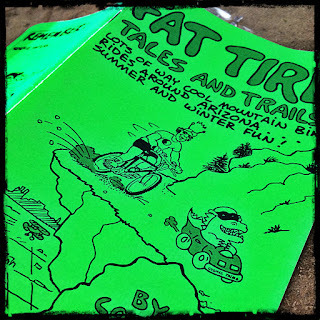 And then, a little later on, I had the chance to publish a few reviews of both his bike and hike books for Flagstaff Live when I was the outdoors editor there for a time. I was able then, too, to convey to our readers the special role Ray's books had played in helping me reshape and redirect my life. I saw him out riding around town yesterday on his stealth Coconino. He didn't see us, even though we were out driving around in our not-so-stealth Forester. But I was reminded, in that moment as we passed him: we've been on some good rides together, Ray and I, some when he was right there riding along side me, and a whole bunch more that he inspired me to go on by writing about them so cleverly in his books. I'm glad that I've been able to tell him, both now and then, how much his books have meant to me. And I'm honored to say, he's included a mention of that fact in the introduction to the most recent edition of his book.